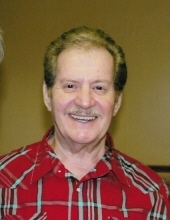 Celebrating the life of Larry Lee Wren, Sr.
Obituary for Larry Lee Wren, Sr.
Larry Lee Wren, Sr., 77 of Escatawpa, MS passed away peacefully on January 31, 2019, surrounded by his loving family. Larry was born on August 13, 1941 in Moorhead, Mississippi to the late Jasper Wren and Lois Mitchell Wren. Larry served 4 years in the United States Army and worked 18 years as a Retail Manager in the shoe business. He loved and enjoyed playing music with friends and entertaining others. He is survived by his wife of 56 years, Carolyn Kuhn Wren; children, Teresa (Buddy) Carrier of Pascagoula, MS, Cindy (Rob) Wirkus of Peyton, CO, and Larry Lee, Jr. (Andrea) Wren of Escatawpa, MS; sisters, Charlotte (Johnny) Formigoni and Janice (late Donald) Brown; grandchildren, Blake Carrier, Bryce Carrier, Nicholas Adams, Heather Adams, and Jessica (Joel) Tanner; great-grandchildren, Savanna and Melina Padilla, Preston, Austin, and Dawson Fowler, and Brason and Brailyn Tanner; along with many nieces, nephews, other relatives, and many friends. Larry’s family would like to thank all of his lifetime musician friends that loved him not only as a friend but as a brother in Christ. The visitation for Larry will be held on Monday, February 4, 2019 from 12:00 p.m. until 1:00 p.m. at Heritage Funeral Home in Escatawpa, MS. The funeral service will follow in the funeral home chapel beginning at 1:00 p.m. with Bro. Robert Bresher Jr. officiating. Interment will be held at Serene Memorial Gardens in Moss Point with Nicholas Adams, Blake Carrier, Bryce Carrier, Buddy Carrier, Edward Kuhn, Jr., and Larry Lee Wren, Jr. serving as pallbearers. Phill Brown will serve as an honorary pallbearer. The family would also like to give a special thanks to the Hospice of Light nurses and caregivers for their comfort and care. Also, thanks to Dr. Persing and his staff at the Singing River Hospital Cancer Center for their care and compassion. To send flowers or a remembrance gift to the family of Larry Lee Wren, Sr., please visit our Tribute Store. "Email Address" would like to share the life celebration of Larry Lee Wren, Sr.. Click on the "link" to go to share a favorite memory or leave a condolence message for the family.